Since Fall 2013, Drs. 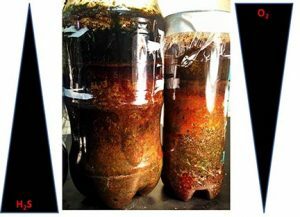 Arango & Forster have used a Winogradsky column lab exercise as a means of having science majors & non-science majors work together to learn the collaborative nature of science while identifying bacteria enriched in the column. Environmental samples of soil and water are packed into a column and incubated for several weeks under light. Over time, an O2 and H2S gradient is generated due to the metabolisms of bacteria (Fig 1 below). The column promotes growth of organisms at various depths corresponding to O2 and H2S concentrations. Over time, colors begin to form in the column. These colors are due to the photosynthetic pigments that are being produced by phototrophs to capture light energy. This live feed is best viewed using Firefox, and the latest version of Java. If you are using Internet Explorer on a Microsoft Windows computer, you may see a warning at the top of your web browser prompting you to allow a D-Link add-on to run. If this happens, click on the warning and click “Run Add-on.” Then click “Run” at the “Internet Explorer – Security Warning dialog window.” For all browsers, you must have Java enabled.